This year the peaceful wintertime watching of the forest inhabitants was disturbed by much logging work in the surrounding forest and transport of timber along the road at the feeding ground. At the moment we are not quite clear about where the sows will move now to give birth to the new generation. The long-delayed spring is beginning to hurry up and next week is the last moment for us to install the web camera setup on the new site. Many thanks to Mait Siimson and the Tähtvere Hunting Society who have cared for the forest animals, and to all helpers, small and big. 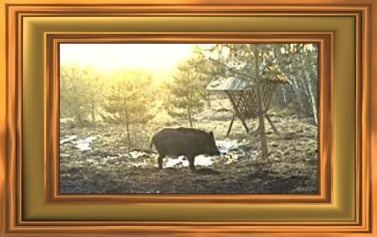 Thanks also to the many watchers of the boar camera and to all who took part in the forum. Until we meet again early next winter! Kernel and Eenet helped in transmitting the camera stream.